A FLEET of new refuse collection vehicles will soon be hitting the streets of Carmarthenshire. Carmarthenshire Council has taken delivery of 28 new lorries; costing around £4million, including 18 26 tonne Mercedes-Benz and 10 15 tonne DAF trucks with NTM bodies. The vehicles will provide a more efficient service to residents and help to increase the county’s recycling rate. They have a separate compartment to keep food waste separate from blue / black bags. The vehicles were officially handed over at Llanelli’s Festival Fields with a very special guest, Welsh rugby legend Sir Gareth Edwards CBE. Sir Gareth, a director with Euro Commercials (South Wales) Ltd, said: “Having come from West Wales it’s great to see such investment in the serious logistics of waste. Euro Commercials truck sales manager Nathan Black said: “The new Euro VI Mercedes-Benz Econic 2630L 6X2 refuse vehicles are rear-steer models; and the rear steer action and 360° on board CCTV gives them increase manoeuvrability, allowing them to access even the hardest to reach places. 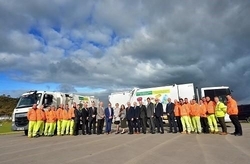 Gareth Rees from Watts Truck & Van Swansea said: “Watts Truck & Van Swansea and DAF are very proud to have supplied the council with 10 new 15 tonne refuse collection vehicles.